L.I.F.T. Bridges are held twice every summer and during winter and spring break. The result has been a cornerstone for knowledge, enrichment, bonding, celebrating and giving back. Each summer the June L.I.F.T. Bridge is a time for new freshman L.I.F.T. Scholars to meet everyone and start establishing bonds. Scholars find out who will be attending their university so they can be peer mentors to the new scholars from the moment they arrive on campus. This academic year Emily Valdez is a junior at U.C. Berkeley working the summer U.C. Berkeley Bridge and is a wonderful peer mentor for freshman Chris McComas and Claudia Jorge. Anne Rivero, a junior at U.C.L.A. and will provide the support needed to peer mentor freshman Angie Vargas, Amanda Salva, and junior Jason Pacheco. David Molina a junior at U.C. Santa Cruz will be able to offer valuable advise to Mayeena Ulkarim. The scholars always come away inspired by just how much every scholar has accomplished with increased G.P.A.’s, internships and jobs in their field of study, volunteer hours in the community, club officer roles, or study abroad experiences. Later in the summer the L.I.F.T. Bridge focus directs L.I.F.T. Scholars to be inspired in their field of study and career possibilities by bringing in guest speakers who followed their passions to a successful career. Heading into college so many scholars think they already know what they plan to study and the job they plan to pursue upon graduation. Then college reality check sets in as they sometimes find themselves actually not academically able to handle the major selected or they find themselves not motivated or they take a class to fill a G.E. or just for fun and realize “I love learning now and I have found my inspiration!” The L.I.F.T. Foundation prides itself on helping to guide these young minds to be inspired. The L.I.F.T. Bridge offers a wonderful platform to have people in entertainment, photography, science, counseling, the arts, entrepreneurship, medicine, literature, education, law and a wealth of professions scholars may not know exist to come and share their stories and wisdom. From William Boyce a famous wildlife photographer to Zach Horwitz, a successful entertainment media entrepreneur L.I.F.T. Scholars remember these real stories and work to make their own lives about passion. Diego Cartagena is a lawyer with Bet Tzedek, giving back to his community through expertise in law for those who cannot afford an attorney, who shares his journey from pre-med to law and the inspiration to pass it forward always. 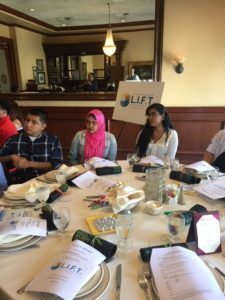 Winter is a time to give back as the L.I.F.T. Foundation has started a tradition of helping the community. It always inspires that L.I.F.T. Scholars, who come from low-income homes where there is often a daily struggle, give back with pure joy and enthusiasm. Last winter we adopted the Boys and Girls Club of Los Angeles. We also reached out to the community before Oscar season and had a special showing of the impactful Oscar winning movie “Hidden Figures” at Baldwin Hills Cinemark Theater. Special guests, all U.C.L.A. alumni, spoke about “Careers in Stem” before the showing.